Creating a more robust terahertz wave from an Airy beam. (Graphic by Michael Osadciw/University of Rochester). Here’s the scene: a suspicious package is found in a public place. The police are called in and clear the area. Forced to work from a distance and unable to peer inside, they fear the worst and decide to detonate the package. New research at the University of Rochester might help authorities in the not-too-distant future be better informed in tackling such situations and do so more safely. Working with a special type of electromagnetic wave—called terahertz (THz)—that’s capable of sensing and/or imaging objects behind barriers, the team demonstrated that they can detect a THz wave at a distance of up to 100 feet. The THz wave created by the researchers is more than five times stronger than what is generated by more conventional means, leading them to believe that a THz wave—and the image of a hidden object—can be detected at much greater distances in the future. The research project was led by Kang Liu, a PhD student in optics, and Xi-Cheng Zhang, the M. Parker Givens Professor of Optics and the director of the Institute of Optics, in collaboration with a group from Greece led by Tzortzakis Stelios. The results have been published in the journal Optica. THz waves, which fall between microwave and the infrared band on the electromagnetic spectrum, can penetrate certain solid objects that are opaque to visible light to create images of what is hidden from view. Unlike traditional x-rays, the waves do so without damaging human tissue. All that makes THz waves a promising tool for Homeland Security and other law enforcement agencies. But before THz waves can be widely used, a number of obstacles need to be overcome, including how to make them more effective over greater distances. Imaging the contents of a teapot using THz waves. Shown are the original teapot, the teapot empty, and the teapot half-full. (Photos by the Lab of Xi-Cheng Zhang/University of Rochester). 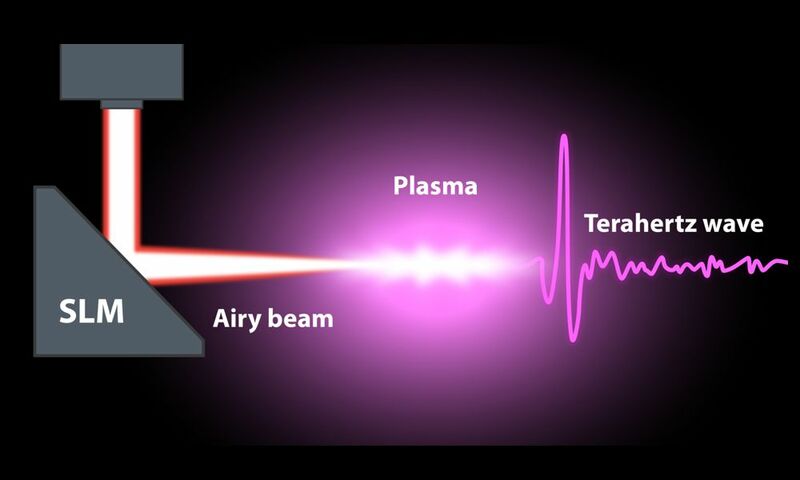 The key to their results was the use of a specific exotic laser beam—called a ring-Airy beam—to generate a THz wave that has 5.3 times the pulse energy of THz waves created with standard Gaussian beams. Ordinary beams of light spread out as they travel, but that’s not the case with ring-Airy beams, which curve toward the center from all points. To begin the process, Liu directed a laser beam onto a spatial light modulator (SLM), which formed the ring-Airy beam. As the name indicates, the beam is circular with a hollow center. Instead of spreading out as it travels, the beam collapsed inward, creating an intensely excited region of free electrons—called a plasma. Those electrons, in turn, generated the THz wave, which would be capable of penetrating a nearby target and reflecting images or providing vital chemical information about what is hidden. The modulator allowed the researchers to change the size of the ring-Airy beam and fine-tune the dimensions of the plasma that is created. The next step, as Liu sees it, is to manipulate ring-Airy beams to create stronger THz waves over greater distances.